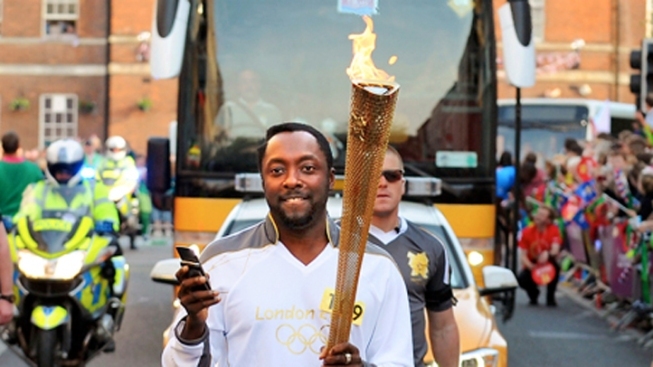 Olympic torchbearer Will.i.am carries the Olympic flame on May 21, 2012 in Taunton, England. Black Eyed Peas star will.i.am has carried the Olympic flame in Britain, trotting through the western English city of Taunton to the cheers of thousands. The 37-year old star was surprise addition to the torch relay on Monday and performed a short moonwalk as the crowd roared. He says he was thinking `'Me and Michael," a reference to the late Michael Jackson, who made the dance move famous. The star, whose real name is William Adams, says he's known for about a year that he'd carry the torch but was told not to tweet about it. But when it all started, he held his phone in the air, asking residents to follow him on Twitter. Unlike others, his torch will not be going up for sale. Will.i.am says "I don't eBay."